E-commerce Get It Right! Book - E-commerce Get It Right! Did you know… 97% of e-commerce websites (shopping websites) make $0 profits in their first 3 years online? Such is the steep learning curve and skill set required to build an e-commerce website that will dominate your product category, market or niche. However it is not all doom and gloom, e-commerce can be exiting, fulfilling and very profitable if you plan from the ground up, grow consistently, and get it right from now! Be Part of the Elite 3% and Get Started with E-commerce Get It Right! About E-commerce Get It Right! Struggling with Your E-commerce Website? You’ll quickly learn how to Dominate your Product Category, Market or Niche and Guarantee Your E-commerce Success. The following Essential Information, is Simplified for Start-Ups & Existing E-commerce Businesses that are struggling to make a profit. FACT! Online Retail & E-commerce is a booming Industry that continues to grow at an explosive rate. Every day thousands of E-commerce businesses are taking market share from traditional offline retail businesses. Online sales are being made each day on a global scale by the millons. Now is the time to take the opportunity of an accelerated start-up regardless of the economy, your background, age or experience. You’ll see how to quickly get accomplished in owning and running your own e-commerce website with E-commerce Get It Right! What does this tell us? E-commerce can be massively exciting, fulfilling and very profitable if you plan from the ground up, grow consistently and get it right, from today! E-commerce Get It Right! simplifies and demystifies my best ideas, insights and strategies. It also details the mistakes I made so that you can avoid them and get it right from the start. I‘m not a professional writer. I‘ve written the book from cover to cover and published the book myself. Just released and written in a no holds barred style… This new and exclusive step-by-step E-commerce Guide, will show you everything you need to know about achieving success with your own e-commerce website and business. In Rapid Time. How to Build & Launch a Super-Charged E-commerce Website & Business – Fast! How to Source, Stock, Sell, Ship, Support with E-commerce! How to Transform a Struggling E-commerce Website! In a nutshell E-commerce Get It Right! 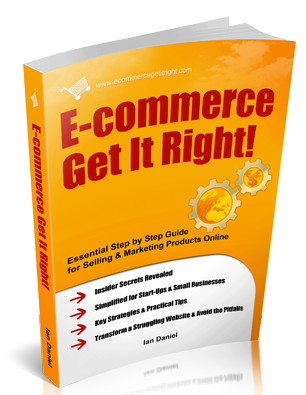 Is an Essential Step-by-Step E-commerce Guide for Selling & Marketing Products Online. It contains Insider Secrets, Key Strategies & Practical Tips. Simplified for Start-ups and Small E-commerce Businesses. Within this book, we are going to break down and analyze the four critical steps required to get explosive E-commerce Sales & Profits – within 30 Days of launch and beyond. Step 1 – Get Started: Setting Up Your E-commerce Success Formula! Step 2 – Get Sales: Build & Launch Your E-commerce Website – Fast! Step 4 – Get More Sales: Marketing to Hordes of Hungry, Ready-to-Buy E-commerce Customers! E-commerce success ultimately comes down to a basic philosophy, can-do attitude and a formula that when planned and executed equals sales, profit and wealth for you and your business. The formula detailed in this book is split into 4 main parts; it’s essentially a 4 step Formula with key components described in each of the 4 steps. Step 1 — Get Started: Setting Up Your E-commerce Success Formula! Step 2 — Get Sales: Build & Launch Your E-commerce Website – Fast! Step 4 — Get More Sales: Marketing to Hordes of Hungry, Ready-to-Buy E-commerce Customers! 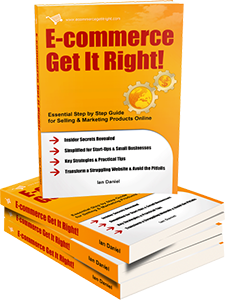 Here’s the bottom line… You will quickly get accomplished in owning, running and producing big profits in your own e-commerce website with E-commerce Get it Right!